Lorna Butler, dean of the College of Nursing. The preliminary results are in and they are positive for College of Nursing students at the University of Saskatchewan. U of S students have earned marks well above the provincial and national averages for the National Council of Licensure Examinations (NCLEX) in Nursing, the new standardized test for nursing graduates in both Canada and the United States. While the tests results are limited at this point—marks have been tabulated for only 66 of the 244 U of S nursing graduates eligible to write the mandatory exams this year—the early numbers released this week by the Canadian Council of Registered Nurse Regulators (CCRNR) show that U of S students posted an average of 79 per cent, exceeding both the Canadian (70.6) and American (78.3 per cent) national averages. 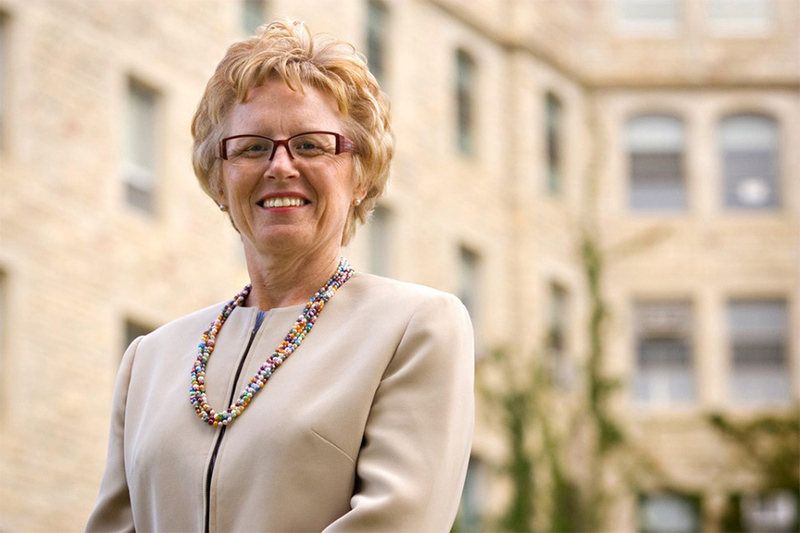 While stressing these are only partial, early numbers—more tests scores from U of S students will be released this fall—College of Nursing Dean Lorna Butler is pleased with the early grades for U of S graduates. "For the 66 students who wrote, they did exceedingly well," said Butler. "We are proud of their performance on a new type of examination. We hope this will continue to represent our total graduates who have written since July 1. We will have a better sense of our overall success in November when additional statistics are released. "Statistics are important to show trends and patterns for the country. What is important to the U of S is how well our own students have performed and what we can learn from their experience." U of S graduates in both the four-year Bachelor of Science in Nursing (BSN) and post-degree PDBSN programs also tested well above the provincial average (60.5 per cent). Butler credits the dedication of her students and faculty for the strong early returns from the new mandatory tests, which are required for graduates to practice as a registered nurse (RN). "Our faculty has worked hard to teach students critical thinking to make decisions," said Butler. "They learn to make choices that can have life-altering implications. The success of our first group of students is most likely a combination of why they chose nursing—it is a difficult program that requires dedicated learners—what they learned, how they were taught to think and problem solve, and their own personal study habits in preparation for the examination. We can provide the resources to prepare, but that is not enough. It is a shared responsibility; the students have to choose to use them and it would seem that they did." Canadian and American nurses, educators and regulators worked together to develop the new NCLEX-RN tests, which replaced the previous Canadian licensing examination in January. Early test results have varied widely across the country, with nursing schools and professional organizations from coast-to-coast, including the Canadian Association of Schools of Nursing, expressing some concerns that the exam doesn't adequately address Canadian context. Like many stakeholders across the country, Butler would like to see some changes to the testing program in the future. "Some members of our college are already involved in writing test questions for the NCLEX-RN. I hope to see more Canadian RNs involved in that process so we have informed educators who can advise us as well."